The technology has gone live on the final section of the M60 between junctions 10 and 18, meaning that the whole of the smart motorway between junction 8 of the M60 at Sale and junction 20 of the M62 at Rochdale is fully operational – a first for the region. 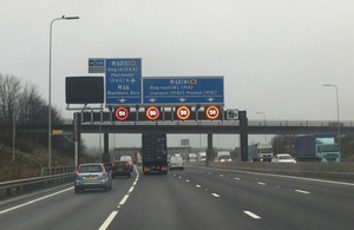 Highways England said that as well as an extra running lane in each direction along the M62 between junction 18 and junction 20, intensive extra technology, such as CCTV cameras and electronic signs, has been provided along both M60 and M62 sections as well as variable mandatory speed limits. Senior project manager Jonathan Stokes said: 'Going live marks the most significant milestone for this project. We would like to thank users of the M60 and M62 and people living around them for their patience and support over the last few years while we have worked to deliver this vital investment in what is an almost uniquely complex environment. Four more smart motorway improvements – delivering 90 miles of extra lanes to the region's motorway network – are also due to be constructed during the next few years. The first of these – the M62 junction 10 to junction 12 project which will link the M6 near Warrington to the M60 near Eccles – is due to start later this month while M56 (junctions 6 to 8), M6 (junctions 21a to 26) and M62 (junctions 20 to 25) schemes are also planned.